This entry was posted in English and tagged Acts, map, New Testament, Paul's missions. Bookmark the permalink. I wonder if its possible for me to use this and the other missionary journey’s for a congregational handout as I preach through this book. Many thanks for your service to the global church. I reckon it wouldn’t be too hard and would be helpful to add in Paul’s earlier journey as reported in Acts (not sure what the ordinal for the number zero is – his naughtiest journey?) 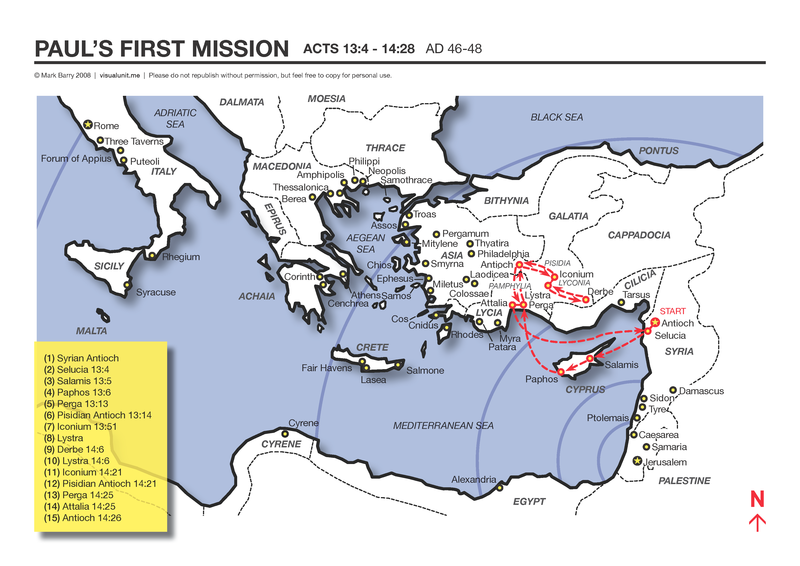 – it would be good to see his journey from Jerusalem to Damascus to Arabia (which may just mean anything east of the Jordan) to Damascus to Jerusalem to Syria (probably Antioch) and Cilicia (probably Tarsus).